Liner is a legend established by film – the signature of some of cinema's most fascinating gazes – and fashion photography, and the ultimate asset of women in search of a cosmetic identity that is theirs alone. More contemporary and desirable than ever, it can be applied as desired – graphic, extending over the eyelid, or more subtle and delicate at the base of the eyelashes. Marking a powerful comeback on runways and in beauty tutorials, it symbolises an infinite desire to create and have fun with make-up to stand apart from the crowd. Or simply to take pleasure in the design process. To unleash the line and push its boundaries, Lancôme has come up with Grandiôse Liner, inspired by the techniques of make-up artists. This revolutionary liner breaks with the norm for a more supple technique and incredible flexibility upon application. A wonderful technological feat, it comprises a pivot allowing a 35-degree curve in the handle and almost unlimited dexterity. Its new dense, opaque and intensely matte formula intensifies the eyes, lending itself to particularly audacious lines. This is one of the best-kept secrets among make-up artists: deliberately angled brushes for enhanced flexibility and creativity and more beautiful eyes. With its 35-degree curved handle, Grandiôse Liner instantly simplifies the technique for a more streamlined application. 35 degrees expressed in 360-degree creativity. The innovative bend is a game-changer, allowing every shade of daring. Lisa Eldridge, Lancôme’s Make-up Creative Director, used her expertise and knowledge to determine the exact angle. This number thus symbolises a change in direction towards creativity. The handle of the Grandiôse Liner can be bent using the pivot and used in two specific positions: straight and curved. Anything is possible in the tilted position with the liner reaching the upper lash line more easily and precisely, from the inner corner to the outer eye. The technique is more user-friendly and simplified as though unlimited. The Grandiôse Liner also has an exceptionally fine tip (just 0.2 mm) with a nylon microfiber and resin texture for total flexibility: two essential characteristics to absolute precision in the line. This is a dip-it liner, meaning the tip will soak the right amount of product when dipped in the bottle. Dense, opaque and intensely matte, the refined pigments create an unusually sophisticated result on the skin. Available by Lancôme in three ultra-intense shades (carbon black, sapphire blue and deep brown), the pure matte finish offers the luxury of infinite hold with no transfer. The water-rich formula slides gently over the skin and dries quickly. The line is unaffected by moisture and sebum, remaining in place. A latex polymer forms a shield that sets the product and protects it throughout the day. This is the perfect formula from any angle with a high-quality application and exceptional hold. Grandiôse Liner is incredibly simple to remove and washes away easily with hot water. 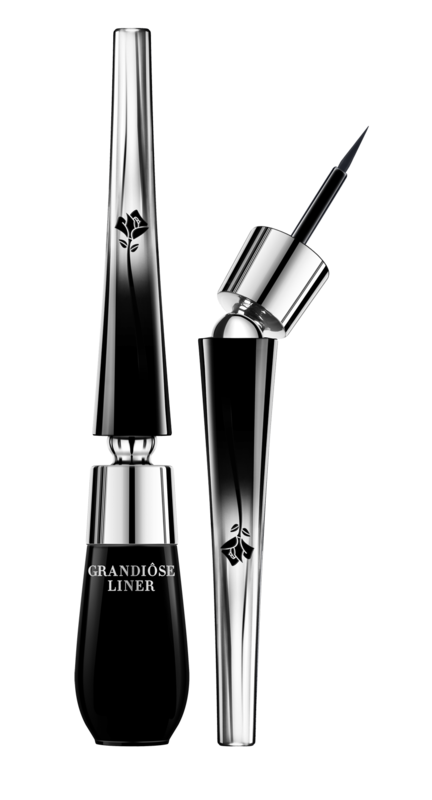 .For 96% of women who tested Grandiôse Liner, it dried quickly. .For 95%, it was easy to hold. .For 95%, the tip was flexible. .For 91.1%, it traced a thin line. .For 90.1%, it offered easier access to the root of the lashes. .For 88.1%, it glided smoothly and easily over the skin during application. .For 86.1%, it was easy to apply. .For 85.1%, it allowed easier control of the line during application. 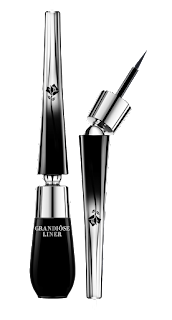 .For 94.1% of women who tested Grandiôse Liner, it boosted their eyes. .For 90.1%, the colour effect was intense. The Grandiôse spirit is a laboratory of ideas to reinvent make-up techniques in ever-more simple and expert ways, thus unleashing the creativity of women in make-up’s supposed most complex area. Complex technologies and constant innovation underpin this simplicity in product after product. New mascara Grandiôse Waterproof is out to complete the Grandiôse look with extreme volume lashes. Now in Waterproof formula Grandiôse’s 'Swan-Neck' wand guides the hand to grab the lashes close to the roots along the lash line. The lashes are fanned out, extended and volumised for extreme sophistication and powers of seduction. The first secret of the volume is the high elastomer content in the brush. Its many bristles are set out in staggered rows of pairs to ensure better separation of the lashes with each stroke of the brush and a more even application. With wide reservoirs, they grab all the lashes at once, depositing the perfect amount of mascara as they move for a volumised result. In an intensely deep, dark black, the excess embraced by this mascara is evident in its colour too. A colour-booster polymer blended with ultra-fine pigments promotes even dispersion in the formula for a black that is pure and dense. Binder optimisation then improves compatibility between the product's aqueous and wax phases, further promoting the dispersion of pigments. Black has never been so powerful, the lashes never so visible. Eye make-up is only really finished and perfect when the brows are brushed, intensified and styled. But achieving a natural brow look is not easy. Lancôme has thus come up with the new-generation eyebrow mascara, inspired by hair styling products, for easy, faultless beauty. For the first time in an eyebrow mascara, Lancôme's elastomer brush styles and disciplines to perfection. And its best asset? It colours the hairs without colouring the skin – the real gauge of naturalness. What's more, its easy-to-use shape moulds perfectly to the brow line. The finish is clean and flawless-looking. The formula contains the same type of gelling agents as those in hair styling products, 14-hour hold. Your eyebrows are ready for anything! The pigments and shimmering effects have been chosen to blend in perfectly with the colour of the hair. Lisa Eldridge has created four shades suitable for all brow tones: transparent, blonde, light brown and brown. *The Lancôme Grandiôse Liner is priced at RM115 and is available at all Lancôme counters from 15th August 2016 nationwide.